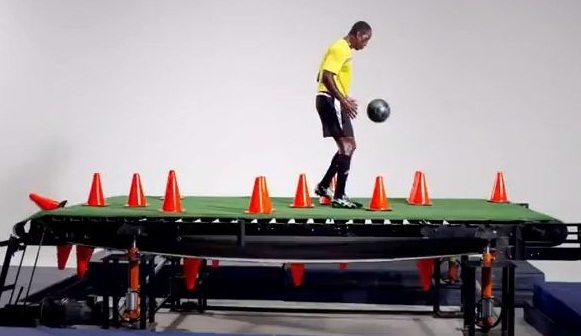 Once again our med size Endless Slope was converted for a commercial this time from a ski slope to an indoor dog walking treadmill and shown on TV during 2016 Superbowl football game. October 2014 SnoZone Endless Slope ski and snowboard school re-opened back where it started from in Curtis Park. Sam Morishima is happy to be back. Now my commute is only 15 steps away. Plans to renovate the original building is planned for summer of 2017. February 1, 2011 SnoZone Endless Slope moved from it's Mighty Kong Cafe/Muffin location on 3701 Stockton Blvd, Sacramento location into the more spacious G2 golf center. Though we will miss the great taste of the muffins, coffee and wonderful meals we are now in a beautiful sports center. Students can now enjoy the surrounding of fitness center and a indoor golf facility. The G2 golf facility is own by a former student Ms Jenni Martin who loved her lessons on the Endless Slope and mentioned that since taking the lessons she not only did it make her a confident and expert skier but it also helped further fine tune her golf ability. She believed that the combination on Skiing/Snowboarding and golf is perfect in many aspects from improving abilities in both sports as well as matching the resorts that have both snow sports and golf. The new school location is wonderful and the students just love the sporting atmosphere. SnoZone Endless Slope is planning to be at both the Sacramento (Nov 20 & 21) and LA (Dec 2 to 5) Ski and Snowboard Dazzle show this season 2010. So be there and stop by our booth and watch us dazzle the crowd with skiing and snowboarding exhibitions and instructions. Go to http://www.SkiDazzle.com for further details and don't miss the show and all the great ski and snowbaord gear sales. Also for shots of our booth at last years Ski & Snowboard Dazzle show go to our Ski Dazzle Photo Gallery page SnoZone Endless Slope photos at Ski Dazzle 2009. SnoZone Endless Slope in Sacramento is once again working with Adventurous Sports in San Francisco at their new location at 650 Florida Str. Sam Morishima plans to teach at the new Adventurous location once a week during the winter. Lessons on the other days of the week will be taught by Adventurous instructors. 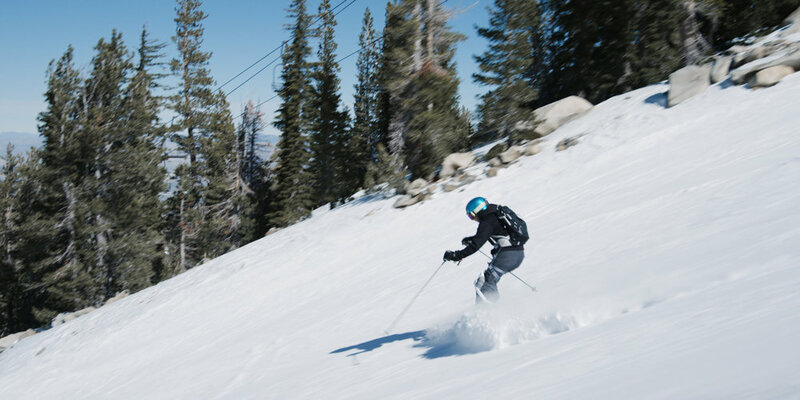 So once again there are two locations (Sacramento or San Francisco) where you can conveniently learn and improve your skiing and snowboarding without the hassles of traveling to the mountains. See our contact page for further details. Waxing your skis or board is really easy and fun to do. A good waxing on your bases can make your skiing or riding more enjoyable, safer and more efficient to ride. Frequent waxing can prolong the life of your equipment. There are many advantages for waxing your own skis or snowboard from cost saving to not depending on others to prepare your ski or board. Our wax clinics can weave you through the maze of waxing information and teach you what is important and practical for you. You actually wax your own skis or snowboard in the clinic. Our clinics can be one on one or in groups. For more information click here on Wax Clinic. 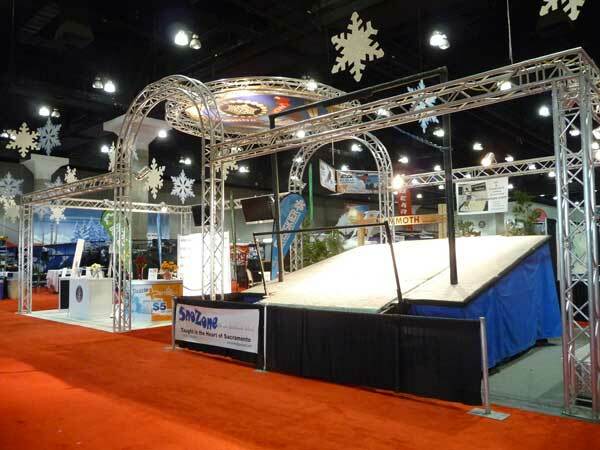 SnoZone Endless Slope was a key attraction at the Los Angeles and Sacramento Ski Dazzle ski and snowboard show. 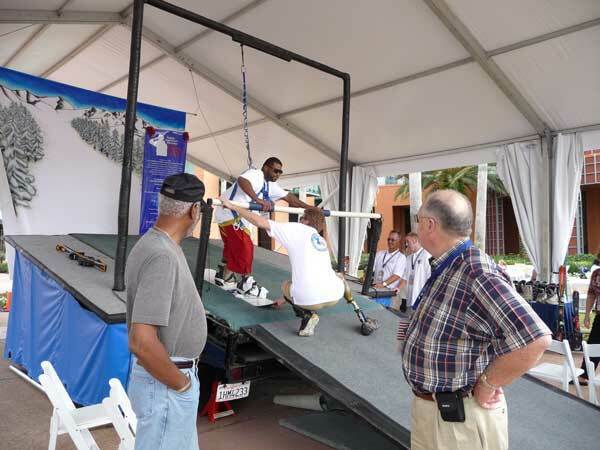 Providing demonstrations on skiing, snowboarding and snow skating as well as attendee participation to ski and snowboard. 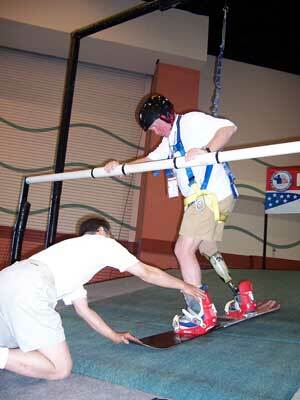 Visit our Ski Dazzle Photo Gallery page for pictures of demonstrators and participants. SnoZone Endless Slope photos at Ski Dazzle 2009. Don't forget to keep up to date with Ski Dazzle and all there events at http://www.SkiDazzle.com on the Ski Dazzle site click on the LA Ski Dazzle Day 1 Video and toward the end of the video you can see some Endless Slope Snowboarding. Don't lose your ski and snowboard skills during the Summer. 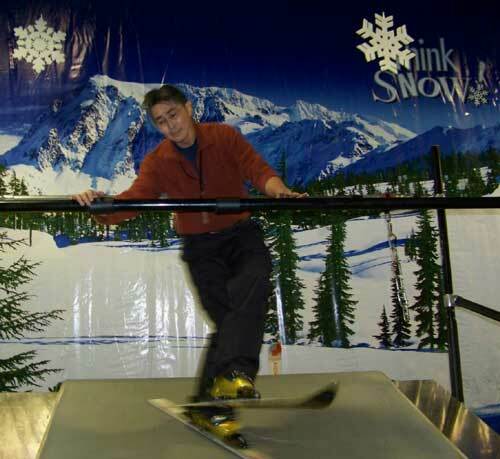 SnoZone Endless Slope Ski and Snowboard School allows you to train and develop your skiing and snowboarding throughout the year in Sacramento. No need for snow or the freezing cold or putting on chains to reach our facility in the heart of Sacramento. 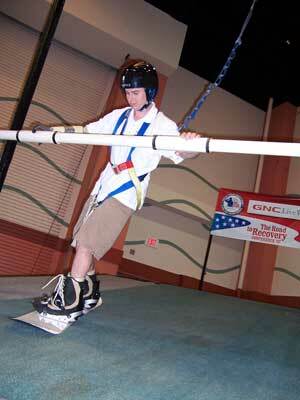 You ski and snowboard on actual skis and snowboard on a endless revolving specialized carpeted surface. It will not only help you keep in ski and snowboard shape but train you to become a riding athlete. Make skiing and snowboarding a natural, effortless and high performance ride. A session on the Endless Slope is equal to a day on the slopes. You will enjoy skiing and snowboarding while you learn and train but most important become a better riding athlete at any age. This just goes to show that you can practically ski and snowboard just about anywhere including in a cafe. The Mighty Kong Cafe building is own by a former student who loved learning on the Endless Slope that he wanted the school to be located in his new building. The new school location is wonderful and the students just love the atmosphere being able to get a cp of coffee and muffin as they wait for there lesson. The school is temporary in the Cafe portion of the building but will move into its own private setting on the grounds of the Mighty Kong Cafe sometime in April 2010 as soon as the site is renovated, but for now the students enjoy the cafe setting as they ski and snowboard. ICER air, Snowbomb Wine and Beer Festival and Warren Miller Film, what better way can you think of to get into the mood for Skiing and Snowboarding. From 2002 until 2005 our 2nd Endless Slope school was located in Pier 38 in San Francisco, right on the bay near the Giants baseball stadium. Did you notice the snowboarding lessons they have in the back corner? I'd never seen before. It was awesome. You hold onto a bar on a carpeted slope in your board and boots and someone teaches you how to turn and do all this stuff. 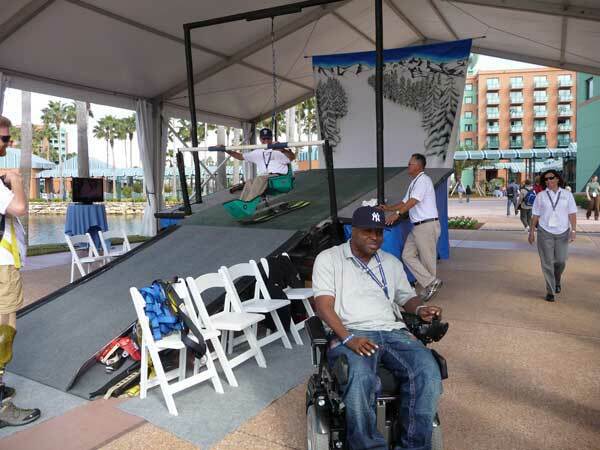 SnoZone Endless Slope at Annual Road to Recovery Conference and Tribute. 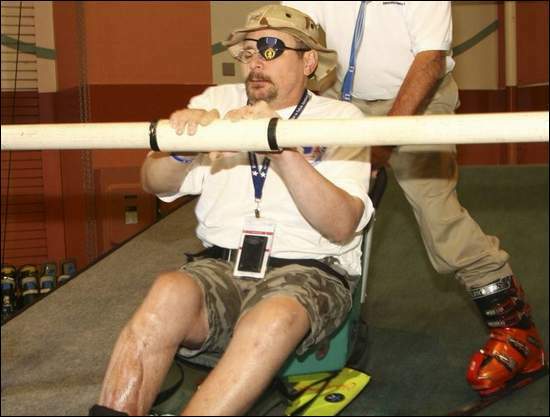 The five-day event, held at Walt Disney World in Orlando, Florida from in November or December, with more than 1,000 people in attendance, will be the nation’s largest gathering of severely wounded troops ever. Endless Slope will be at the event providing opportunity for lessons on skiing and snowboarding using specially adapted equipments and expert instructors for the disabled. A big thanks to Darryl Noda of Giro for providing helmets protecting the skiers and boarders at the event. Sam Morishima Snowboard Clinic February 8 -13 2008, introducing the Endless Slope Training Platform. Buttermilk Mountain Resort owned by the Kaiser family is developing into a world-class ski resort. It is one of the premier environments in Ontario for instructing children and beginners. They have the largest Super-Pipe in the entire Mid-West of Canada and the United States. The Super-Pipe is almost 500 feet long and 85 feet wide with a 21-foot depth and a 22% grade. The entrance into the Super-Pipe drops 35 feet with a 45% grade and the Super-Pipe ends with two 10-foot jumps. The Super-Pipe is flanked with two 25-foot pedestals running the entire length on both sides. 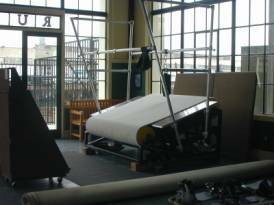 The Ski Doctor is Sacramento's premier full service ski shop offering top equipment and service. o serve the skiing community. AT&T Park, 801 3rd St, San Francisco, Fr 1pm-9pm (The Village - in Parking Lot A area south of AT&T Park on opposite side of McCovey Cove between 3rd St & Terry Francois Blvd), Sa 10am-6pm (The Village), Sa 1pm-9pm (The Stadium) $10 Fr/$24 Sa/$30 Fri & Sat combo ticket general admission, Sa & combo Snowbomb tickets include FREE lift ticket to a Lake Tahoe ski resort. $1,000,000 ski/snowboard sale, Olympic & X Games skiers/snowboarders, bands. The Stadium - big air skiing/snowboarding, vert ramp, concert stage. The Village - freestyle motorcross, skate/BMX park, wakeboarding, music stage, beer garden, snow sports vendor booths. www.icerair.com 40,000 attendees expected. 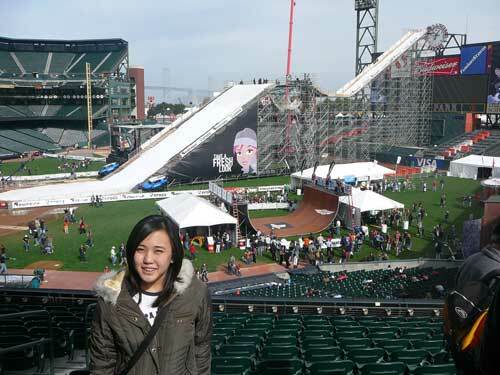 SnoZone Endless Slope will be next door to the ATT park at Pier 38. drop in and celebrate with us. Over 25,000 spectators descended upon the ball park now converted for one day into a slopeside snow big air event stadium. Packed onto the field was a music stage surrounded by several large tent size booths and in the center a monstrous 100-foot-high big air jump ramp laden with 200 tons of manmade snow with a gapping 20 foot mouth that boarders and skiers had to clear. The structure could be seen from the Bay Bridge as it glowed in the night air before opening morning Saturday Nov 4. It towered up to the Stadium clock waiting for the athletes to mount it for a ride into another chapter of San Francisco’s history. The standings of the event went as follows: In the skier category TJ Schiller,took first with a awesome 1080 betting our Jon Olsson’s switch 900. Steele Spence came in third with a 900. The remainder of the men’s ski division finished in the following order: Cory Vanular, Josh Bibby, John Spriggs, Peter Olenick, Chris Benchetler, Pep Fujas, Sammy Carlson, Simon Dumont, Sean Field and Tim Durtschi. Regarding the snowboarding side, Travis Rice, took the title with little doubt with a corked backside 7. Andreas Wiig came in second performing a backside rodeo 900. Olympian Danny Kass hit a backside 900 placing him in third. Brent Meyer in fourth followed by Chas Guillemond, Andy Finch, Juuso Laivisto, Wyatt Caldwell, Louie Vito, Bjorn Leines, Tim Humphries and Corey Noble. In the women’s skiing Michelle Parker took the lead followed by Kaya Turski and Shiadasha Holmstead. In snowboarding, Jamie Anderson captured first followed by Laurie Currier in second and Bev Viggue in third. I did get a chance to talk to Michelle Parker the evening before the event. Born in Truckee she is now 19 years old and had attended high school at North Tahoe and graduated early to ski. We talked about her very first, first place trophy won at Northstar at the age of 6. She mentioned that her Mom and brother also took home trophies that day but dad lost out. Her strategy for this event she said was just to do her best. A dynamic skier who can perform under pressure and simply cranks when it comes to aerials is just warming up. Keep an eye on her this season, she’s going BIG!. Congratulations on the win! The event did not go with out its incidences. With the mid day sun melting the snow created drag on the skis and boards such that it reek havoc on the the women’s competition. Kaya Turski skier was carried off on a backboard stretcher after hitting a 540 with a landing that pulled her onto the slated walking platform running up the sides of the landing slope tripping her resulting in a body slide down the massive ribbed walkway. Let’s hope that Kaya comes out of this ok so she can compete in this winter season. The 20 ft gap also swallowed Laurrie Currie snowboarder as she literally rolled right into the opening falling 30 ft below into the safety net. With the cooling of the evening and newly made snow the evening men’s event went smoothly with crowd pleasing aerials. The whole day’s event was unreal with live music from Jurassic 5, Ladytron and Chaingarden along with Wakeboarding, BMX and skate boarding exhibitions. 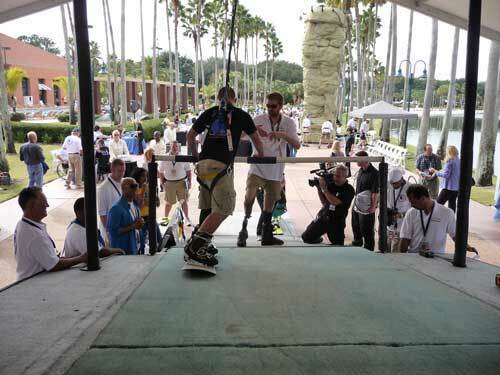 Tony Hawk himself was there to display his vertical moves on the halfpipe. In Covey Cove wake boarding demos ruffled the waters as boats hurled the riders into the air. Jonny Moseley was on hand to host and emcee the event as wells as test the monstrous slope with his signature aerials. The stadium field was swamped with people moving to the sounds of the Jurassic 5 and the stands were filled with people as paper airplanes soared down from the different levels. With riders in the air above all else was a site to behold as nonstop action glued your attention all around you. SnoZone Endless Slope ski and snowboard school conveniently located at Pier 38 near the AT&T stadium and was rocking with people on the Endless Slope and a Bar-B-Que party on the pier. If you weren’t there you missed the biggest winter opening event in the USA or perhaps in the world. But don’t worry if all goes well there will be another next year. This is just too good to not have even a bigger and better event in 2007. It was certainly one “Giant” party at AT&T park! CSUS will hold their massive and I mean massive Ski and Snowboard Swap to be held on the grounds of California State University Sacramento Campus at the Sac State Ball Room, University Union, on Sunday Oct. 22. Here's your opportunity to buy, sell and trade your wares or check out the great vendor booths from the Lake Tahoe Resorts and pick-up great season lift passes at show prices. Even if you just want to hang out and enjoy the scene, with live music and people who love to ride. SnoZone Endless Slope will be there so drop on by and say hello. Time is from 8:00AM to 5:00 PM. The 41st Annual Ski Swap is just around the corner! It's the best place in Northern California to sell your old gear and hook yourself/family a great new set-up. Vendor's will be bringing in last year's gear that is priced from 30% to 60% off! There was snow on the ground and skiers and boarders in the air. Well then it must be San Francisco! On Thursday Sept. 29, 2005 a historical event occurred in San Francisco. 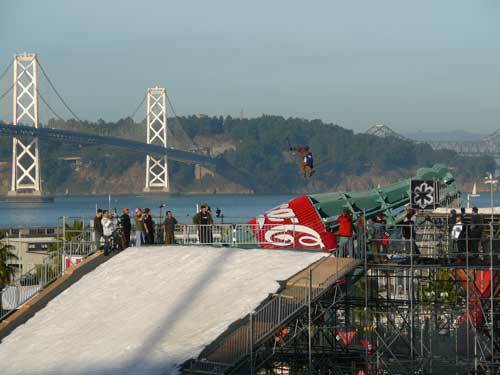 It was SF's first Big Air ski and snowboard jumping competition on Fillmore street known as the Icer Air 2005 event. On top of the intersection of Fillmore and Broadway with the starting gate as a Cable car skiers and snowboarder competed for best hang time in the air. Crowds were intense with estimates of 15,000 to 20,000 spectators. It is said that 200 tons of shaved man made ice was laid on insulation foam on two blocks of the steep Fillmore street in Pacific Heights. Spoke to one snowboarder fan who said “Yah cut out of class to see this one!” Many others were skipping time from work just to be at the Big Event. What a way to get jazzed about this winter! The man-made snow was chilling or should I say melting in the beautiful mid-80 clear blue sky day. One snowboarder contestant Shane Reide a Pro-rider for AstroRide told me that it was getting pretty sticky. They had to be yanked out of the starting gate by the arms to get a faster start and they couldn’t use any edge otherwise making the jump would have been impossible. The skiers had a better chance than the snowboarders for the distance due to the snow conditions. Shane thinks he did pretty well in the event and was pretty happy. You can see Shane in true form in the air on the Tahoe Card ad in ski and boarder magazines and papers. It was an awesome sight to see skiers and boarders in air with landmarks of the Alcatraz and the Golden Gate in the background. Endless Slope was there with AstroRide and we performed on the AstroRide Quarter pipe and on the Endless Slope Ski Deck on Vallejo Street where the Riders were at the height of their jump at the intersection of Fillmore and Vallejo. How great was that! For San Franciscans what a way to get started for winter! Rumor has it they want to make this an annual event! Possible that the next one is planned for AT& T (SBC) Park on Nov 4, 2006! Over $ 1 million worth of new and used merchandise for all ages. To be held at the Student Union on the California State University Sacramento campus. SnoZone Endless Slope will be present with live ski and snowboard demonstrations (weather permitting) and a children sled area. Free Sugarbowl/Kirkwood lift tickets for the first 800 paying attendees as well as a Vail Trip give away worth over $1,700 and other ticket and pass specials. 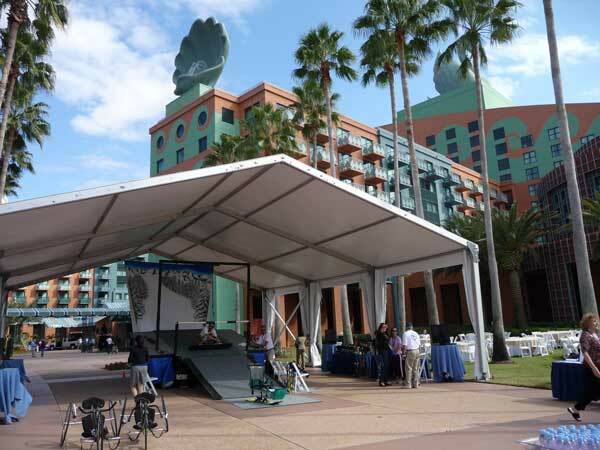 Surf/Wakeboard Expo in Orlando Florida at the Convention Center to feature Endless Slope! At the Proflight wakeboard tower booth SnoZone ski and snowboard school will be demoing wake skating, snowboarding and sking on the Endless Slope. This is Surf/Wakeboard Expo, the marketplace of choice for retailers who sell apparel and accessories to more than 32.2 million consumers nationwide. Now in its 29th year and drawing an average 15,000 attendees — from all 50 states, the Caribbean and South America — each January and September, Surf Expo has got the excitement and vibe of the markets it serves, but is also known for its professional, "business-first" environment. Surf Expo is where manufacturers come to write paper and retailers come to buy. BLIZZARD, a skiers and snowboarders party. Benefit fund raiser party for Tahoe Blue. At the Library at 1042 Folsom Blvd from 6 PM to 9 PM. 18+ admitted. Full Bar for 21+. 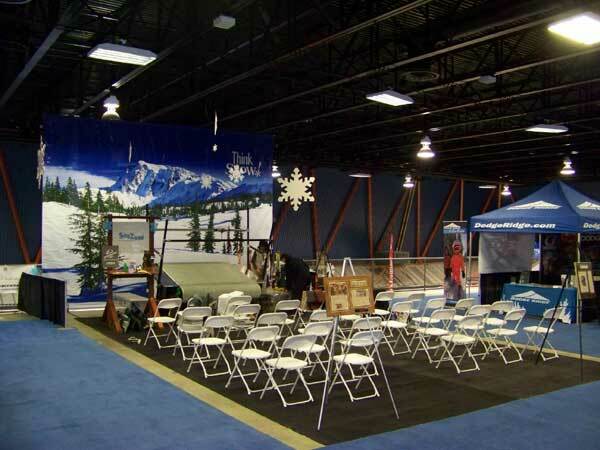 SnoZone Endless Slope has appeared at several events, shows, exhibitions, TV, commercials & venues. For a listing of past activities please click here at: "Where we've been"